Full disclosure: Almonds are not my favourite nut. In the pantheon of nuts they are somewhere near the bottom. Even still I have always been curious about almond butter. Of course it's easy to assume that almond butter tastes like almonds, but this is true only to a point. Just like peanut butter it depends on how it is being applied and what it is being applied with. Bread type? Toasted vs un-toasted? Jam? And what kind? Or will it be on its own? And what about when you throw that all away? How does it taste directly from the jar, right off the spoon? (Something that is frequently enjoyed with peanut butter in our house). Week after week I contemplated these questions as I slowly pushed my cart past the almond butter at the grocery store, scoffing at the price. Seven bucks for 480g? I think not! 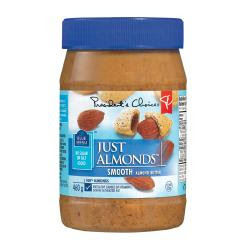 Sure, I could have thrown a bunch of almonds in a food processor and made my own, but at that point I would rather reach for my dear friend, Peanut Butter. Finally last week there was a sale. Two dollars off, which for some reason made it sound a much more reasonable venture (even though it's still not at the economy of your standard peanut butter). So, I bought a jar hoping it was worth the money. Well I guess it depends on how much you like almonds. It definitely tastes like almonds, but in a much more distinctive way than peanut butter tastes like peanuts. The almond flavour seems to steam roll any paired flavours. Peanut butter plays well with other flavours. When you combine peanut butter with jam, you get a peanut butter and jam sandwich. When you combine almond butter with jam, you get an almond butter sandwich with jam. A subtle difference, but significant I think. You see, Peanut Butter is better than Jam, but you would never know from the way it acts. Peanut Butter is happy to invite Jam over to just hangout and spend some time together. Peanut Butter wants to be friends, gladly sitting in the cheap seats, eating a greasy hot dog drinking a domestic beer. In contrast, Almond Butter wants nothing more then to show off. Almond Butter answers its door wearing a silk robe, a glass of sherry in hand, speaking incessantly of the black truffle topped kobe beef filets being served on the African Blackwood dining table. In short, Almond Butter is a bit of a jerk. Here's the thing, you kinda get used to it. After six days straight the Almond Butter is a tolerable jerk. It's still more noticeable then Peanut Butter but once you're accustomed to it it comes down to whether you think it's a better pairing with your eats then Peanut Butter. Would I buy it again? Probably not, and definitely not for the asking price. I can see it having nice baking potential in cookies, cakes, etc. But for day to day I prefer peanut butter, plain and simple.